Our Group of companies were incorporated in 2009. Although we have had our mother company for over 20 years. The Emaar Ventures website domain (“emaarventures.com”) however was only registered on the 8th of June 2016, revealing this to be a lie. The official date of the founding of Emaar Ventures Company is June 27, 2009. Its founders and non-replaceable leaders for today are Japanese businessmen, Kazuki Mariyatsu, Arabian business guru Mohamed Alabbar, Nikko Yamaguti, as well as a successful Russian businessman Vyacheslav Nikiforov. 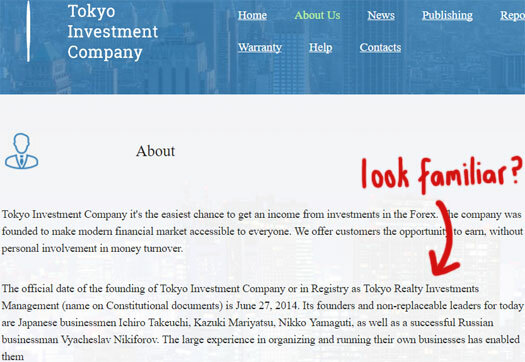 Tokyo Investment Company appears to be some sort of collapsed forex HYIP scheme. No information is available about Kazuki Mariyatsu outside of Emaar Ventures and Tokyo Investment Company. Mohamed Alabbar is an actual businessman from the UAE and Chairman of Emaar Properties. one of the largest real estate development companies in the world and known for developing the Burj Khalifa, the world’s tallest building and the Dubai Mall,the world’s largest mall. Vyacheslav Nikiforov is the name of a Russian Director and former football player. There’s no well-known person bearing this name connected to the business world. It appears whoever is actually running Emaar Ventures simply appropriated Mohamed Alabbar and the Emaar Properties company name, added two more fictitious owners and ran with it. Emaar Ventures has no retailable products or services, with affiliates only able to market Emaar Ventures affiliate membership itself. Emaar Ventures affiliates invest $20 to $50,000 on the promise of a daily ROI. Referral commissions are available on funds invested by recruited Emaar Ventures affiliates, paid out via a unilevel compensation structure. Emaar Ventures affiliate membership is tied to an investment of between $20 and $50,000. What is needed for a maximum profitable and effective Investor Membership with Emaar Ventures Company? Right from the beginning Emaar Ventures is a business opportunity wrapped in fraud. Pretty much everything about the company’s history presented on the Emaar Ventures website is bogus. The founders don’t exist, nor is there a valid explanation as to how Emaar Ventures generated 700% ROIs in 300 days. Quite obviously all that’s happening is Emaar Ventures are using newly invested funds to pay off existing investors. This makes it a Ponzi scheme. Daily ROI rates are higher on the lower plans to encourage initial investment. The idea is that once paid more money will be invested at the higher plans which provides the Emaar Ventures admin(s) more time to collect money before they shutdown and run. Naive affiliates will be presented numbers on a screen in a backoffice, signifying daily ROI payments that don’t actually exist. Somewhere between 100 to 300 days the Emaar Ventures admin(s) will do a runner, with affiliates not realizing they’ve been scammed until it’s too late (they’ll keep quiet as long as an imaginary daily ROI is generated in their backoffice). Hello sir/muddam,we have already invested in emaar from East Africa Uganda but mobile wallet and bank wire are not responding accordingly, so we need help for withdraws. we are still facing a problem for of mobile wallet withdraw. so please help us because we want to invest more cash. thanks emaar admin. That a Ponzi scheme has disabled withdrawals is hardly surprising. You didn’t think all those backoffice ROIs were real money did you? 3. Tell us about Alliance… It also works like emaar. Hi, thanks for this info. It is the gullible Ugandans like Ssonko who have fallen prey to yet another scam by their own Ugandans. That site was quickly crafted by some Ugandan who wishes to make quick money. Ssonko ensure you alert you colleagues in there that this site will not last longer than 300 days as the investors are soon making negative ROI and all the admin has to do is flee. More so it is a mere HYIP the modus operandi of which is new stuff to Ugandans, so it seems! Emaar is simply going to scam. Do not talk about banks wires as that will not be possible anytime soon. Simply put, the owner of Emaar ventures is a Ugandan and remains synonymous because he knows he will have to run away with your money! Go to Alexa……over 90% affiliates are from Uganda and very few (less than 3%) are from Kenya. By having a blockage of the mobile wallet and bank wires, the owner ensures he keeps in profit as the gullible lot thinks of making some quick money. Your best bet is probably approaching whoever recruited you. You’ll know because you won’t be able to withdraw anything. Doesn’t take much for a website to continue to show you monopoly money earnings on the backend. Ugandans are so gullible. There are other real businesses but not this HYIP (High Yielding Investment Program). Why of all the millions of HYIPs online would you pick emaarventures? What is so special with emaarventures HYIP? There are HYIPs paying over 10% daily and you are here talking of another HYIP paying only 3%? All HYIPs are damn risky, why risk with a low paying HYIP like Emaarventures? The answer is HYIPs are new businesses to you. Quit HYIPs. This is not the first HYIP to be owned by a Ugandan! Just 2 years ago Muramuzi Ronald had his HYIPs close and ran off with a bounty. I wantto believe he too owns this HYIP or someone borrowed a leaf and started it all. He registered companies that ran high-yield investment programs (HYIP), including Tesco Trader, Adfast Inc, Bank Electro, United Hype League and Massive Ads, but all opened under different names Morgan Mugisha, Bob Mugisha, Muramuzi Ronald Kato and Kato Ronald. When I try to confirm the ownership of the the Official Mobile Wallet Numbers for the Ugandan airtel line, Uganda Airtel (removed), it is owned by Kelvin Kwok! Now even the name itself sounds phony, Kwok! You guys are gonna get kwoked. IF he is the official representative, then ask him to clear you guys, you should not have a problem with mobile wallet withdrawals as Ssonko claims. Notice that much as the Emmarventures is owned by Russians and Arabs, no one from their countries of abode is an affiliate….. all the ‘tumbav’ affiliates are from Uganda. Run away from Emaarventures as fast and as early as you can. Soon we are going to establish the owners and hand them over but one thing you should know is that you will not be compensated. Emaarventures is not registered in Uganda. If it is a genuine business pester the top promoters to register it before you can introduce others to the scam. Do not dare to refer others because that is one sure way to lose your relations. In addition, you can refer them and get that referral bonus but in due course, you will ‘vomit’ all this money simply because the ones you refer will lose when it closes and that will open up police cases for you…..you will learn the hard way. With the various hyips from Muramuzi, many people lost money and reported to Police….our hungry police loves such cases and i saw many lose property…. be warned! I told many of my colleague to refreighn from fake promising which seems to be real, you should always know that there is no gain without pain. Am only working for two company for 3 years now no disappointments and no faking real company worldwide and am ok with my little return than my money sleeping in a bank withou profit…. sorry for my fellow ugandans. I have just got this information after registering yesterday, I wish I new it before ooh noo my money soon going. All their contacts are off shown on the website. What, and you you think “Address: Downtown Dubai – Dubai – United Arab Emirates” is real? The Hong Kong address is virtual. And in any case, providing contact addresses doesn’t justify Ponzi fraud. Have joined this company less than a month ago with 168000 ugshs but have earned more than 2 millions through member to member but am worried that my friends who I referred will loose their money though me. I recovered mine with abnormal prifit huhuhuhu i can’t guess how i will loose my friends. And, where are those 2 million UGSHS ??? In your Emaar back office or in your pocket ?? In my pocket because i sold my back office money to new members who joined. Pius: In my pocket because i sold my back office money to new members who joined. Rip off those who come after you and leave them holding worthless accounts. As long as you get yours,’ screw everybody else. We regret to inform you that with effect from 10th January 2017 we have removed Mobile wallet deposits and withdraws in the following countries Slovakia ,Hungary, Bangladesh, Uganda and Gabon. We have further removed /suspended deposits or payments made through any of the payment methods that have been in use before. This follows a series of attempts by Hackers to impersonate and swap and replace the Mobile wallet Phone numbers used to pay and receive Payments for Emaar Ventures. The Criminals have gone further to duplicate Emaar Ventures Business and website platforms with the same intention of cheating our clients. All the members are encouraged to Market, broaden and resell their earned E-funds on their Emaar Ventures System Wallet accounts. The Old and New Members who are joining the business in the said countries are fore cautioned that it shall be their obligation and responsibility to market and ensure that they sell their earned E-Funds to have the continuity of the business. This suspension shall keep on until the said problems are solved. This means we are finished for real. even the interest tampered with. They say other networking companies hacked into theirs. how true is this? Emaar Ventures is a Ponzi scheme. They’re just making up excuses to cover the fact they ran out of money. The government should look out for such fools and protect her people. And we should also learn from such mistakes. Hope I don’t lose trust from the friends I referred to Emaar. Lastly, these Emaar fools should go to hell. U guys, where is Emaar ventures? we invested our money and this is the way it’s going to thank us? i hate hate the fact that evn the whole thing is out and no longer active but cant help my moneys. i invested without gaining even a single penny… GOD SHOULD FORGIVE THEM. Am really disappointed but I hv nothing to do about the issue. in uganda emaar has closed with our money. is it true that it is operating in some other countries like Kenya? Sounds like they might be going the MMM Global route with localization. A fraudulent unsustainable business model is still going to collapse no matter where you run it though. The long awaited happened, Emaar Ventures closed by Friday end of last week. They started by deceiving their “clients” that they had a hack-in issue, then mobile wallet issue (couldn’t pay investors), promised to correct stuff by 17th Jan, 2017 but never made any changes. Even their rent tenure expired on 22nd Jan, 2017 and they never renewed it, so offices at Emrald Hotel on Bombo Road closed. The so called company country representatives denied having worked for such company and many guys lost their money. They included soldiers and now the company owners are in a hide-out. They included Nantale Zaituni (a masters’ IT specialist working with Google offices in Uganda Kampala), Denis Ainebyona (a physics / mathematics teacher who refused to work but lives on gambling for money), Ambrose Another (a mechanical engineer/ mathematics guru, who scooped over a billion Uganda shillings from Telex-free scam) all graduates of Makerere University. Zaituni also lectures at Makerere University Faculty of Computer Science and Information Technology and at Jinja for IT. This clique is on the run but they are being searched east and west because in Uganda such money laundering scams are considered a security threat in the face of guerilla rebel threats in opposition such as ADF and others. It’s been heard that these could be fetching money for the rebels and so attached to these rebels. And among their victims (ripped clients) included military soldiers who are looking for the gang seriously! The scam closed their website by Friday 27th Jan, 2017 after knowing they’ve been unearthed and Zaituni known to have been the one who registered the wesite and the mobilewallet numbers. Emaar ventures is a Ponzi scheme and it was a disguised Ugandan concoction by some three local guys fronting a certain Brian Musheruzi as a major country representative but the guy is just these people’s foolish pupet and has no knowledge that he was being used, being put at the forefront of the trio’s scam as a scapegoat! He is even a poor student! His Ugandan contact is (removed). This was the contact used even on the Emaar Ventures’ facebook page, even on his own fb page as Musheruzi Brian. You’ll soon hear what fate will befall these crooks! In case you can track their phone contacts you could get them and have them pay your monies guys; in Uganda earning even Ugx 10,000/= is not that simple. So, they can’t think that they will get away with it. Atleast their property will be sold and mony recovered coz I know some of them could have used already to acquire property like land. Imagine; they took people’s money not having any viable projected business to do with it!!!!!! These are born-thieves, grown-up thieves and dying-thieves!!!!!!!!!! The Ambrose Another guy has property in Matugga trading centre. Even the name ANOTHER as one’s second name depicts a running thug!!!!! So don’t wait for any rectification of problems, just go pickup the guys and get your monies back! The company has no international roots at all. It was only trying to extend to East African countries but no sooner had they started than they closed. If there was an international attachment people would have been able to withdraw money from elsewhere but it’s impossible. WARNING: Don’t use violence or kill them because you’ll lose the money. Just put them to book and ask them to unearth your monies, now that luckily they are Ugandans. I invested in dat so called Emaar Ventures $45 dats ugx153000 but at least got more than ugx205000 before their shutdown. I think diz month I was planning to deposit more than ugx500000. emmar is scamm they came in kenya just the other day only to run away with our money. dubai is not heaven we come to your offices there we need our money. Maggie, you shouldn’t bother yourself going to Dubai and look no further, the bogus guys are in Uganda! All the designs and lies of locations were fake, you wont find Emaar Ventures in Dubai, all there’s in Dubai is Emaar Group of property developers which has no slightest connection with this scam! If you can read the comments I posted above then you can see your way to recovery. Am a victim of the scram where i hve lost 100$ Am just praying that we find the thieves. Thank thank you for wake please who are dreaming. Si how will I processus to truck their phone numbers? I have lost 100 dollars ans am not un uganda. It’s unfortunate that you’ve lost your dollars but if you may get the guys, come here at 12pm – 1pm East African Time(EAT) and I give you their contacts because I had left them here the other time and the admin for this blog/ site deleted them off. I actually wonder, he/she could be one of them! Sharing personal contact information of third-parties is a privacy issue. When people try to contact victims of scams I usually remove contact details too, because you never really know who it is trying to reach out. These people had offices at Emerald Hotel but on 22/01/2017 their rent expired and they didn’t renew the contract. They instead moved on shortly before the expiry of rental contract. It’s not the government who closed the offices but the scammers just ran away silently. They first vacated the offices before much signal was detected, shortly after that they also closed the website, shortly after that they changed the facebook page name and the so called country representative Brian Musheruzi changed his facebook name to Dan Muhanguzi but his contacts there are still the same. any way forward reached in tracking these thugs??????? people give us links so that we can recover our hard earned money. I invested three million Uganda shillings with this company on 12th January, 2017. But its now March and nothing has transpired only to hear they were thieves. please I need your help. Emaar Ventures is a Ponzi scheme, you’re supposed to lose money in it. If you only start looking for answers after you’ve lost money it’s too late. Not much to be done after it collapses I’m afraid. Just don’t fall into the trap of investing in another one to recoup your losses. hoping our money has not gone completely. Just agree our money went just like that. Mrs. A: "Please post updates if and when the trial begins in July 2019. There doesn’t seem..."
Whip: "scammer meltdowns = always funny"
Oz: "OZ let´s debate in equal conditions … The law isn’t up for debate. That´s..."
Oz: "if all hospital on the planet using this product we dont need doctor anymore right Right...."
Oz: "Actually in this article ABC addresses Todd Disner regarding Ad Surf Daily and Zeek..."